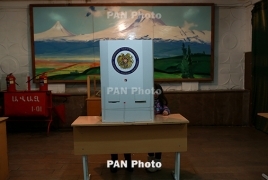 PanARMENIAN.Net - My Step alliance led by Armenia's acting Prime Minister Nikol Pashinyan has secured a convincing victory in Sunday's snap parliamentary election, with 70.43% of all the ballots cast in their favor. Two more parties - Prosperous Armenia and Bright Armenia - have also collected enough votes to have seats in the National Assembly. They have won 8.27% and 6.37% of the vote, respectively. No other political party has made it to the parliament. According to data provided by the Central Electoral Commission, 1,260,000 (48.63%) eligible voters cast ballots in elections. Pashinyan first swept to power after months of peaceful protests and a civil disobedience campaign as tens of thousands of people took to the streets across the country demanding the resignation of former authorities. Election campaign launched across Armenia on November 26 with leaders of parties and alliances traveling to the various provinces of the country for 12 days through December 7. Eleven political forces were running in elections, including two blocs - Im Kayl “(My Step) and Menk (We) - as well as nine parties - Prosperous Armenia, National Progress, Christian Democratic Revival, Sasna Tsrer, Rule of Law, the Armenian Revolutionary Federation, Bright Armenia, the Republican Party of Armenia, Citizen's Decision Social-Democratic Party. Pashinyan resigned on October 16 after sweeping to power back in May.